When recommending the right program for a customer, the following factors need to be considered: the size of the organization, whether they want perpetual or non-perpetual licenses, whether they want Software Assurance or not, and whether they want to standardize the software on all PCs in their organization or not. 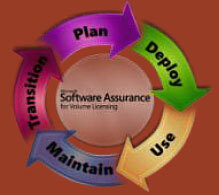 Software licenses, however purchased, are an organization’s software assets. The management of these is called Software Asset Management (SAM). Tools such as Microsoft System Center Configuration Manager can help identify what is deployed, whilst purchasing licenses through a Volume Licensing agreement provides a single place to manage software licenses through the VLSC (Volume Licensing Service Center). With a perpetual license the customer owns the license and can use the software throughout the term of the licensing agreement and forever afterwards. With a non-perpetual license, like a rental agreement, the customer can only use the software throughout the term of the licensing agreement. Note that External Users can be licensed via this model by purchasing CALs for them. Examples of products to which this model applies include Microsoft® Windows Server® 2008 R2 and Microsoft® Exchange Server 2010. Some server products offer different levels of functionality that can be exposed to users or devices, and there are CALs that correspond to this functionality. The core functionality offered by the server (depicted by the blue shading) is linked to a Standard CAL (depicted by the blue license). If the extended functionality (depicted by the red shading), is utilized, then the purchase of an Enterprise CAL is required (depicted by the red license) in addition to the Standard CAL. Standard and Enterprise CALs can also be used to license External Users. Products to which this model applies include Microsoft® SharePoint® Server 2010 and Exchange Server 2010. For Microsoft® Office Communications Server 2007 R2, Standard and Enterprise External Connector Licenses are also available. License the server which the external users will access in the usual way, and then purchase an additional External Connector license to license all external users and devices. Products to which this model applies include Windows Server 2008 R2 and Exchange Server 2010. Purchase a license for each processor used by the product in the physical servers. These licenses entitle ALL internal and external devices and users to connect to the server and so there is no requirement for CALs. Products to which this model applies include Microsoft® SQL Server® 2008 R2 and Microsoft® BizTalk® Server 2009. Purchase a server license for the Management Server. 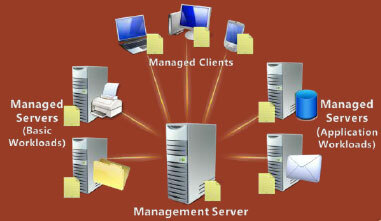 Managed client devices require Client Management Licenses, and managed servers require either a Standard Server Management License (ML) if running basic workloads or an Enterprise Server Management License if running application workloads.